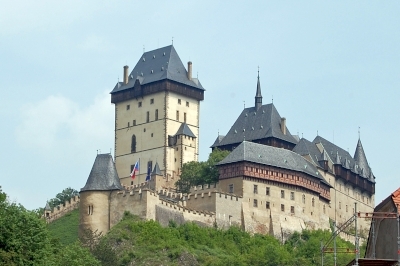 The Karlstejn Castle is part of the Tentative list of Czechia in order to qualify for inclusion in the World Heritage List. My one and only visit to Karlštejn Castle took place nearly a decade ago, but seeing that there are no other reviews for it, even a dated one might be useful. The grand castle is located some 30 kilometers away from Prague, and most visits to it are likely to be day-trips from the capital. If you join one of the many organized tours, it will pick you up at your hotel and deposit you back in under 5 hours. If you go on your own, budget 6-7 hours for the whole trip, including getting to the central train station in Prague, possibly waiting for the next train (they run once every 30 minutes), the 35-minute ride, then getting to the castle from the station, and later doing it all again in reverse on the way back. The visit to the castle itself takes just over an hour. The visits are guided, the groups depart at specific intervals, so there could be some additional wait there. Walking up the hill to the castle from the train station may easily take an hour for the less athletic, but will definitely take at least 30 minutes (an organized tour will not bring you any closer to the top of the hill - you still will have to walk up). Thankfully, the village along the road up to the castle is full of souvenir shops and eateries, and also has a couple of nice art galleries. Some of it has a whiff of a tourist trap, but for those who are not concerned with time, it offers welcome additional diversions. Is the effort worth it in the end? Not unequivocally. At the castle, you will visit six or seven halls and hear some interesting commentary, but not much of the interior is going to bowl you over. The views from the ramparts are quite nice, but some of the higher points of the castle are off limits for the visitors (or were in 2010). If you are a true aficionado of the Middle Ages history, you will find the castle and the village quite enchanting. The average visitor might be somewhat disappointed. I would give it two and a half stars at most.